In this study , uni-directionaly reinforced laminates that arranged e-glass / epoxy composite samples in the form [ + 45 / -45 / 90/0 ]s and [ + 45 / -45 / 90/0 ]2s was applied low-velocity impact tests at impact energies of 10, 20 and 30 J has been obtained 8 and 16 laminated sample. Low-velocity impact tests were performed with the drop weight test device. Low-velocity impact damage was created on the samples depending on the different impact energies as a result of experiments conducted with hemispherical various impactor. The impactor mass was 6.350 kg. Digital imaging process method was applied images of the samples subjected to impact damage and damage maps for each damage zone were extracted. Also, change graph of damage area depending on the impact energies has been omitted. Changing damage zones were extracted. Also, change graph of damage area depending on the impact energies has been omitted. M. Uyaner and M. Kara, “Dynamic response of laminated composites subjected to low-velocity impact.” Journal of Composite Materials, 2007, 41(24), p. 2877-2896. M. Uyaner, M. Kara and N. Ataberk, “Impact behavior of e-glass/epoxy laminated composite”, 7th. International Fracture Conference, Kocaeli, Turkey, 2005, p:813-821. M. V. Hosur, C. R. L. Murthy, T. S. Ramamurthy and A. Shet, “Estimation of impact-induced damage in CFRR laminates through ultrasonic imaging”, NDT & E International, 1998, 31(5), p. 359-374. K. Srinivasan, W. C. Jackson, B. T. Smith and J. A. Hinkley, “Characterization of damage modes in impacted thermoset and thermoplastic composites”, Journal of reinforced plastics and composites, 1992, 11(10), p. 1111-1126. X. E. Gros, “Revıew of NDT technıques for detectıon of low-energy ımpacts ın carbon reınforcements”, Sampe Journal, 1995, 31(2), p. 29-34. ISNAD KARA, Memduh . "Mapping with the Image Processing Method of Damage Regions with Respect Composite Laminates Subjected to Low Velocity". 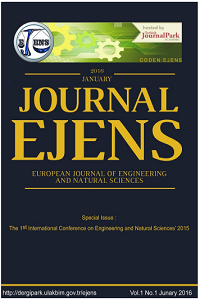 European Journal of Engineering and Natural Sciences 2 / 1 (February 2017): 154-160.